Through their lawyers, Leigh Day & Co, the doctors have listed their reasons in a petition document known as a ‘memorial’. It argues that Dr Kelly’s death was not sufficiently investigated and claims there are a large number of irregularities surrounding it. The decision to call in independent medical experts represents a breakthrough in their campaign. It shows how seriously the Attorney General is treating their concerns about the official verdict, recorded by the Hutton Inquiry, that Dr Kelly committed suicide. Last month, the Mail revealed how Mr Grieve had requested Dr Kelly’s post-mortem examination report from Justice Secretary Kenneth Clarke. Lord Hutton had instructed the papers should remain secret for 70 years. But Mr Grieve used special powers he holds to take control of the files – which campaigners believe could hold the key to the case. He wants a group of entirely independent experts – likely to include doctors and a coroner – to study the documentation for any discrepancies which would justify the holding of an inquest. The law states the High Court can only agree to hold the inquiry if there is ‘new evidence’ to challenge Lord Hutton’s verdict. The process of studying the evidence is likely to take several months. In the meantime, Mr Clarke is considering a separate application for the post-mortem examination files to be made available to the public. Dr Kelly’s family, including his widow Janice, have made it known they are opposed to the release of the files and the holding of an inquest. 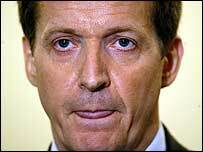 Dr Kelly’s body was found in woods near his house in Oxfordshire in July 2003 shortly after he was unmasked as the key source of a BBC report suggesting the government lied to justify Britain’s invasion of Iraq in 2003. Unusually, no coroner’s inquest has ever been held. Instead, the then Lord Chancellor, Lord Falconer, used an obscure law to appoint Lord Hutton to chair a public inquiry into his death. 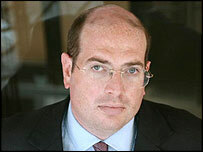 In contrast to an inquest witnesses could not be compelled to give evidence to the Hutton Inquiry. Mr Grieve has said ‘people who have expressed concerns about why Lord Hutton did not tie up every loose end may have a valid point’. But he said he could not order a new probe ‘on a hunch’. Lord Falconer said it was ‘a matter for others to decide’ if there should be an inquest. In his interview, 59-year-old Mr Bartlett discloses a further series of irregularities about that day’s events, putting yet more pressure on the Government to agree to a full inquest into the scientist’s death. 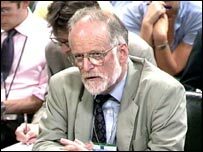 Ministers have met to discuss whether to release information about the death of government scientist Dr David Kelly and to hold a formal inquest. It is understood Justice Secretary Ken Clarke is considering whether to release papers on Dr Kelly's autopsy. 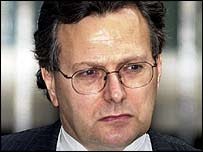 The weapons expert's body was found in 2003 near his Oxfordshire home after he was exposed as the source of a BBC story on the grounds for war in Iraq. 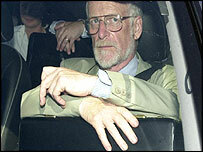 In his 2004 inquiry, Lord Hutton found that Dr Kelly had committed suicide. But several legal and medical experts have questioned the official cause of death, given as a haemorrhage, and called for an official inquest to take place. 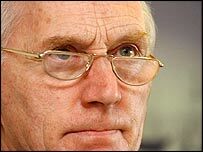 The then Prime Minister Tony Blair asked Lord Hutton to conduct an investigation into Dr Kelly's death instead of an inquest. Mr Clarke met Lord Hutton on Tuesday and Attorney General Dominic Grieve on Wednesday to discuss the case. BBC home affairs correspondent Danny Shaw said it was understood that no decision has been reached on whether to release medical papers or to ask the High Court to order a fresh inquest, and that further discussions were required. A spokesman for the Ministry of Justice said a request for the release of medical papers was "currently under consideration". Lord Hutton's inquiry found 59-year-old Dr Kelly died from blood loss after slashing his wrist with a blunt gardening knife. But several legal and medical professionals have questioned the verdict as "extremely unlikely" in the light of new evidence. In a letter to the Times earlier this year, former coroner Michael Powers, a former deputy coroner Margaret Bloom, and Julian Bion, a professor of intensive care medicine, claimed Lord Hutton's conclusion was unsafe. They argued the wound to Dr Kelly's wrist was unlikely to be life-threatening unless an individual had a blood-clotting deficiency as "insufficient blood would have been lost to threaten life". But the pathologist who performed the post-mortem examination on Dr Kelly's body has insisted that his was a "textbook case" of suicide. In August, Nicholas Hunt said the scientist's death was a "classic case of self-inflicted injury" and he believed an official inquest would confirm this. 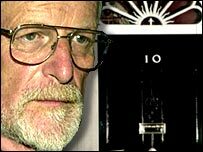 SENIOR government ministers met last night to discuss the possible release of information about the death of government scientist Dr David Kelly in 2003. The weapons expert’s body was found near his Oxfordshire home after he was exposed as the source of BBC reports on a Government’s dossier on the threat posed by Saddam Hussein’s Iraq. Although an inquiry into the affair by Lord Hutton concluded that Llwynypia-born Dr Kelly committed suicide, there having been growing calls for an inquest into his death. Lord Hutton, who met Justice Secretary Ken Clarke earlier this week, ruled at the time that his inquiry superseded an inquest. Mr Clarke is considering whether to release papers on Dr Kelly’s autopsy, and whether to ask the High Court to order an inquest. Mr Clarke met Attorney General Dominic Grieve yesterday, but it is understood no decisions had yet been reached. Lord Hutton’s inquiry found 59-year-old Dr Kelly died from blood loss after slashing his wrist with a blunt gardening knife. A group of former coroners claimed earlier this year that there were question marks over that conclusion, although the pathologist who performed the post-mortem on Dr Kelly’s body has insisted it was a “textbook case” of suicide. In August, Nicholas Hunt said the scientist’s death was a “classic case of self-inflicted injury” and he believed an official inquest would confirm this. Barrister Michael Powers QC, who is acting for the former coroners in their bid to force an inquest, said: “We can’t wait indefinitely for the Government to make a decision. The doctors’ argument is that there has been insufficient inquiry into the death. 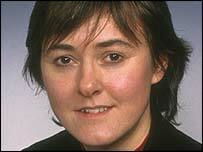 Dr Kelly’s body was found in July 2003 after he was identified as the source of a BBC story claiming the Government “sexed up” its now notorious dossier on Iraq’s supposed weapons of mass destruction. Lord Hutton concluded Dr Kelly took his own life and that the principal cause of death was “bleeding from incised wounds to his left wrist which Dr Kelly had inflicted on himself with the knife found beside his body”. He also found the scientist took an overdose of co-proxamol tablets – a painkiller commonly used for arthritis – and that he was suffering from an undiagnosed heart condition. But there have been a number of calls for another examination of the case and earlier this month Mr Grieve said: “We would like to resolve this in a way that can give the public reassurance. But he said he could not apply to the High Court for an inquest on a “hunch” and would have to take account of the feelings of the scientist’s close family, who have not asked for a new investigation into his death. “I have been given no evidence to suggest an alternative cause of death,” Mr Grieve said. In his memoir, published last week, former prime minister Tony Blair wrote: “I will never know precisely what made Dr Kelly take his own life. Who can ever know the reason behind these things? It was so sad, unnecessary and terrible. He had given such good and loyal service over so many years. A group of leading doctors will go to the high court next week in an attempt to force an inquest into the death of Dr David Kelly. The six doctors claim it is not possible to prove that Dr Kelly committed suicide based on the medical information available. 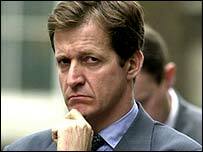 They want to obtain a court ruling that would require Dominic Grieve, the Attorney General, to seek a new inquest. Mr Grieve's request would also need High Court approval. The doctors, who began their legal action last December, argue an inquest should take place because the medical evidence into the government weapons inspector's death has never been discussed publicly. Although an inquest was opened, it was adjourned due to the Hutton inquiry and has never resumed. Lord Falconer, then the Lord Chancellor, decided not to resume it, arguing that the Hutton Inquiry was sufficient. Hopes an inquest would finally take place were raised after Dominic Grieve, the Attorney General, asked to review medical documents relating to the death of Dr Kelly. 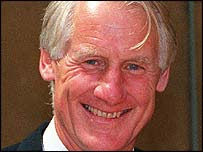 Mr Grieve said an inquest would only be allowed to take place in the event that new evidence is found. The doctors appealing for an inquest, all experts in trauma and vascular surgery, are Dr Stephen Frost; Dr Martin Birnstingl; Dr David Halpin; Dr Andrew Rouse; Dr Christopher Burns-Cox; and Dr Michael Powers QC. Frances Swaine, a solicitor representing all of the doctors except Dr Powers, insisted they were motivated by "professional integrity" and that the Hutton inquiry's verdict that Dr Kelly bled to death after cutting his wrist was not sufficiently proved. The inquiry, commissioned by then Prime Minister Tony Blair and led by Lord Hutton, found that Dr Kelly committed suicide in woods near his home in Oxfordshire in July 2003. His death followed the disclosure that he was the source behind claims that the Government "sexed up" a dossier on potential weapons of mass destruction in Iraq. 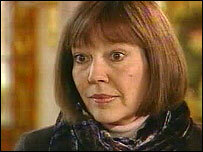 Ms Swaine said: "They think it outrageous that this view has simply been accepted without examination. 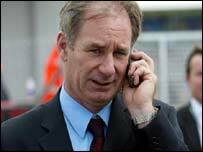 "We have not seen any evidence that Dr Kelly bled to death in the way Lord Hutton thought likely." In a separate move, the doctors have also requested permission to examine medical documentation related to Dr Kelly's death. Lord Hutton initially ruled that medical documents relating to the death would be kept secret for 70 years, but has indicated he will not block their publication. Kenneth Clarke, the Justice Secretary, is expected to give the doctors an answer next week. Ms Swaine claimed the arrival at a verdict of suicide without proper examination of the medical evidence was uncommon, adding: "The post-mortem report was seen by Lord Hutton but so far as we know, never considered, at least not at the inquiry." Last month a separate group of nine doctors voiced concerns that Dr Kelly could not have died from cutting the small ulnar artery in his wrist. The Attorney General's spokesman confirmed legal papers had been submitted to the Ministry of Justice. 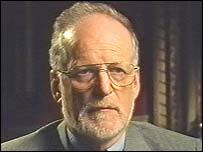 Attorney General Dominic Grieve has made a dramatic U-turn and taken possession of secret files which could trigger an inquest into the death of Dr David Kelly. The Mail can reveal that Mr Grieve and his officials will shortly begin poring over post-mortem reports which Lord Hutton controversially ruled should be kept under lock and key for 70 years. It is a highly unusual step which means that, for the first time, Mr Grieve is actively seeking the evidence required to hold a new inquiry into the weapons inspector's death. He previously insisted he had no 'investigative function' and that he could only view the documents if they were released to the public by Justice Secretary Ken Clarke. Whitehall sources say the fact that Mr Grieve has requested the files does not mean an inquest will definitely take place. However, it will speed up the decision-making process, they said. Campaigners say Dr Kelly could not have taken his life by cutting a small artery in his wrist - the verdict reached by the Hutton Inquiry. 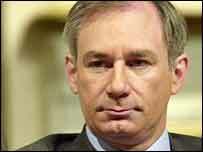 Tony Blair appointed Lord Hutton in 2003 to head a public inquiry into his death. But, unusually, no inquest was held because the then Lord Chancellor Lord Falconer ruled the inquiry would suffice. Sceptics hope the opening of the previously secret medical reports - including a controversial postmortem by the pathologist Nicholas Hunt - will unearth sufficient concerns to justify holding a fresh investigation. Mr Grieve has said 'people who have expressed concerns about why Lord Hutton did not tie up every loose end may have a valid point'. But he said he could not order a new probe 'on a hunch', and that he must first gain access to the secret papers. After repeatedly saying it was down to Mr Clarke to release the documents, Government sources say he changed his mind last week and asked the Ministry of Justice if they could be sent to his department. He took possession of the files earlier this week, according to Whitehall insiders. The Mail revealed last month that, as Attorney General, he was entitled to see the papers, regardless of whether Mr Clarke rules they are suitable for public release. The Justice Secretary has yet to reach a decision on whether they should be made available to anyone other than Mr Grieve. Lord Hutton instructed they should be kept hidden for 70 years to protect the Kelly family - who do not want a new investigation - from further distress. Mr Grieve will wish to establish whether there are any discrepancies between the post-mortem report and Lord Hutton's official verdict of how Dr Kelly died. 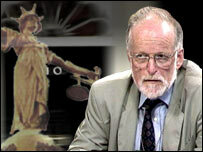 The weapons expert's body was found in a wood near his Oxfordshire home in July 2003, shortly after he had been exposed as the source of a BBC report which said the government had exaggerated the grounds for going to war in Iraq. Lord Hutton concluded that he had taken his own life by severing the small ulnar artery in his wrist with a blunt garden knife. But nine doctors have written an open letter casting grave doubt that Dr Kelly could have died from loss of blood in the way described. Mr Grieve has also been sent a medical report by a group of eminent doctors suggesting it would have been 'impossible' for Dr Kelly to lose sufficient blood through the artery to kill him. The Attorney General will also wish to check whether there are any differences between the pathology reports and recent public remarks made by Dr Hunt. The pathologist insisted Dr Kelly's death was a 'textbook' case of suicide and that he had found nothing to indicate the weapons expert was murdered, despite an eight-hour examination of the body. Dr Hunt contradicted claims that there was not enough blood and added that there was 'nothing to suggest' the body had been moved, another claim from critics of the investigation. The doctors campaigning for an inquest have written to Mr Clarke saying Dr Hunt was wrong to publish confidential evidence that the Government is still refusing to release and that has not been placed before a coroner. In their letter, they say Dr Hunt's comments appear to be part of an officially sanctioned attempt to silence the clamour for an inquest. Tony Blair blames former Radio 4 Today journalist Andrew Gilligan for dealing a permanent blow to his own integrity with his infamous report about the “sexing-up” of the dossier making the case for war with Iraq. In his memoirs published today, former Prime Minister Blair talks in detail about the BBC’s reporting of the “45-minute” claim on weapons of mass destruction in Iraq and the creation of the September 2002 dossier. He admits that the intelligence on WMD was wrong, and that this was a “real story”. But he denies Gilligan’s implication of deceit which turned a “difficult situation” into one which “remains an ugly one” and "set the pattern for interaction between ourselves and the media in the years that followed". 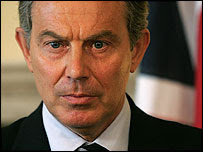 Blair quotes at length from one of Gilligan’s Radio 4 Today Programme reports on 29 May, 2003. 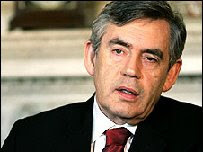 Blair says: “The intelligence was wrong. We admitted it. We apologised for it. We explained it, even. But it was never enough, in today’s media, for there to have been a mistake. “The mistake is serious; but it is an error. Humans make errors. And, given Saddam’s history, it was an understandable error. But it leads to a headline that doesn’t satisfy today’s craving for scandal. Blair says that the 45-minute claim was put in the dossier by the Joint Intelligence Committee. 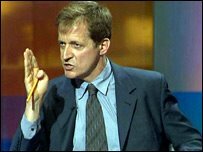 He adds that Gilligan made the situation worse by claiming in a Mail on Sunday story that Alastair Campbell was the author of the 45-minute claim. Blair says: “It was never clear if Dr Kelly, who though he admitted talking to Gilligan denied making the allegation, really did brief him in terms that justify the story. “But what followed set the pattern for the interaction between ourselves and the media in the years that followed. Relations between myself and the BBC never really recovered; and parts of the media were pretty off limits after it." Blair says that the public naming of government advisor Dr David Kelly as Gilligan’s source was “the subject of brutal media allegations, particularly against Alastair”. “It was suggested that he had leaked the name in breach of instructions from the Ministry of Defence. He hadn’t. It was simply that once we knew it was Dr Kelly, and since the Foreign Affairs Committee was engaged in investigating the 45-minutes claim and broadcast, we would have been at risk of a charge of concealment from them had we known the source of the leak and refused to say." 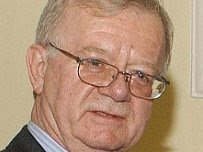 Blair said the “whole thing was handled by Dr Kelly’s line management” leading to the release of Kelly’s name on 10 July. Blair describes being woken in the middle of the night after addressing Congress in the United States 17 July to be told the news that Dr Kelly had apparently taken his own life. “Of course in the rational world, it would be a personal tragedy. It would be explained by the pressure on him. It would be treated as an isolated event. I knew there was not the slightest chance of that happening in our media climate. Talking in general about the reporting of the Dr Kelly affair and the subsequent Hutton Report, Blair says: “The Gilligan broadcast led the news because it alleged misconduct, a lie, in effect. He thought he had a source, but an allegation that serious should at least, you would have thought, be put to the people against whom it was made. “We were never even contacted before it was broadcast. In any event, a mere mistake was never going to lead the news. “Now, in actual fact, it should do. The intelligence was wrong and we should have, and I have, apologised for it. So the real story is a story and a true one. But in today’s environment, it doesn’t have that sensational, outrage-producing ‘wow’ factor of scandal. Hence the error is made into a deception.